The topic of aliens from outer space can make as much sense as a cattle stampede. Many people believe that there are extraterrestrial visitors who traveled amazingly vast distances through impossible-to-survive conditions in outer space to visit us. What for, just to say "Howdy?" 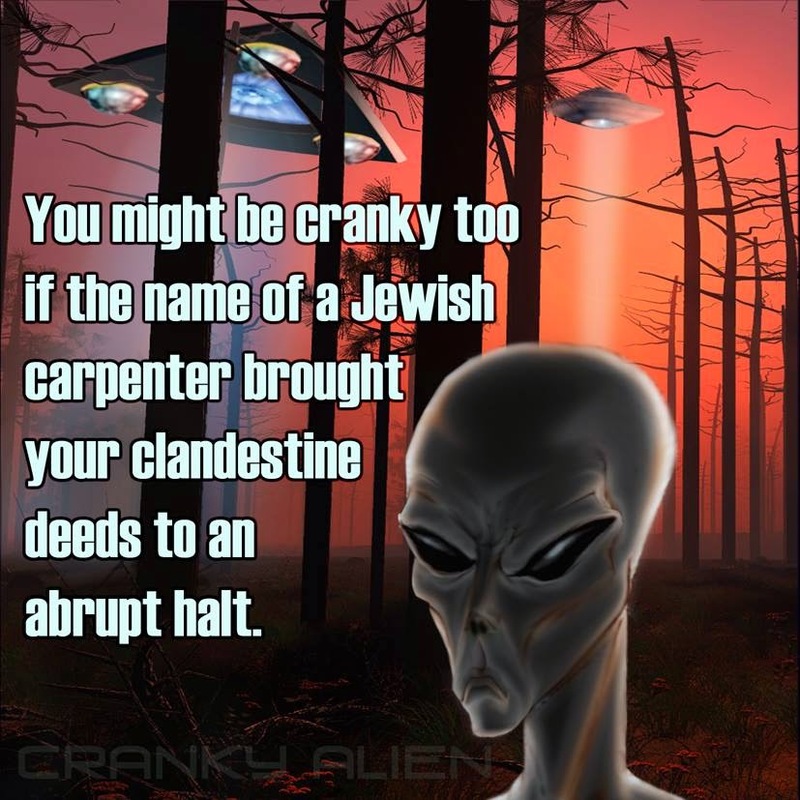 Others reject space aliens as products of imagination, psychotic episodes, mistakes, or are faked. Then you hear about how UFOs are secret government flying machines. See? Orderly as a stampede. To dismiss UFOs and aliens outright is to impugn the integrity of many respectable people. Something happened to various people, and others did see something in the sky. By my cogitations, those space ships are probably military aircraft — and something sinister as well. Those visitations by extraterrestrials? They're not from outer space. If ET says he's from out there, he's lying. Having reluctantly abandoned my belief that we are visited by space strangers, I have a mix of ideas that I think make sense, and they fit with my biblical creationist worldview. When people have communicated with aliens, they often are given a "message for humanity". This often arrives through "channeling", an occult practice used by spirit mediums. The message is typical New Age jargon, and has either no mention of the Bible and Jesus, or actually disrespects them. We've been warned about that (Galatians 1:8). It has been noted that when someone is undergoing an abduction and they cry out to Jesus, everything suddenly stops. Would a being from another world be bothered by the name of the Creator (John 1:3, Colossians 1:16) ? Not hardly! In an interview on Derek Gilbert's show "View from the Bunker" (the episode was called "Joe Jordan — Unholy Communion"), Derek referred to Joe's earlier comment that beings who appear as space aliens have a purpose to deceive us. He then asked what their goal is in this deception. Joe replied that their goal is to take our eyes and focus away from the one true God. If they can get us to doubt that the one true creator God is who he says he is, then we are lost souls. I agree with others, that beings that claim to be from outer space are actually deceptive demons. I'm going to ride off the trail a bit now, and tie this into the origins controversy. Evolutionism is another gospel, full of mythology that tries to replace biblical truth. There is no need for God, the deity in charge is Evolution. No sin, no need for redemption, the only need for salvation is through "science". Demons claiming to be from outer space are, what? More evolved! Evolution deceives us, and takes our eyes off God. People use evolution to justify their rebellion against God, and to doubt that God is who he says he is — and they are lost souls. We need to watch who we're listening to, and especially who we're believing. We cannot be our own gods (Genesis 3:4-5), and we must humble ourselves (Matthew 18:4) and accept the gift of God through Jesus Christ (Ephesians 2:8-9), and we can become children of the living God (John 1:12-13). God is the Creator, and he makes the rules. We come to him on his terms, not ours — and not through the lies of pretend space aliens. For some interesting reading on aliens, abductions and such, I refer you to this series of links, and recommend Alien Intrusion by Gary Bates.